Since her impressive breakout turn in “The Wolf Of Wall Street,” Margot Robbie has been missing from the big screen with three films set to hit this year, one of which is the Sundance-premiering “Z for Zachariah.” While we won’t have a review until after the screening this weekend, you can make do with a short clip from the post-apocalyptic film, via Hitfix. Running under a minute, the clip centers on an innocent moment between the three survivors of a disaster that wipes out most of the planet. Though it could be billed as a picture in the science-fiction realm, the film is directed by Craig Zobel, whose “Compliance” focused on the ways people can wield power over others. So yeah, expect less gunfights and more exploration of the relationships that develop between strangers in the face of a tragedy. “Z for Zachariah” premieres at the Sundance Film Festival this Saturday at the Library Center Theatre at 8:30 PM. Watch the clip below and keep an eye out for our review. It’s certainly a promising role for Kidman, who most recently appeared in the extremely well-received Paddington, which is still in theaters. Queen of the Desert will premiere at the Berlin International Film Festival, where it will be screened in competition. UNIVERSAL PICTURES’ EVEREST IS AN ADVENTURE-THRILLER FILM INSPIRED BY THE REAL EVENTS SURROUNDING A TREACHEROUS ATTEMPT TO REACH THE SUMMIT OF THE WORLD’S HIGHEST MOUNTAIN. IT FOLLOWS THE AWE-INSPIRING JOURNEY OF TWO DIFFERENT EXPEDITIONS CHALLENGED BEYOND THEIR LIMITS BY ONE OF THE FIERCEST SNOWSTORMS EVER ENCOUNTERED BY MANKIND. THEIR METTLE TESTED BY THE HARSHEST OF ELEMENTS FOUND ON THE PLANET, THE CLIMBERS WILL BE SEEN FACING NEARLY IMPOSSIBLE OBSTACLES AS THEIR LIFELONG OBSESSION BECOMES A BREATHTAKING STRUGGLE FOR THEIR VERY SURVIVAL. Directed by Baltasar Kormakur from a screenplay written by Simon Beaufoy and Mark Medoff, Everest will be shown in theaters in 3D beginning September 18. Everest stars Martin Henderson, Jake Gyllenhaal, Josh Brolin, Keira Knightley, Emily Watson, Michael Kelly, John Hawkes, Sam Worthington, Jason Clarke, Robin Wright, and Thomas M. Wright. Others in the cast include Martin Henderson, Michael Kelly, Naoko Mori, Clive Standen, Vanessa Kirby, Tom Goodman-Hill, Ingvar Eggert Sigurosson, Charlotte Boving, and Micah Hauptman. The film which is now in post-production is being scored by Dario Marianelli. According to the studio, the upcoming movie is based on the real events of the 1996 Mount Everest disaster wherein eight people were caught in a blizzard and died as they struggled to reach and then descend from the summit. There were then two expedition groups of mountain climbers. One led by Scott Fischer (played by Jake Gyllenhaal) was called ‘Mountain Madness’ while the other, called ‘Adventure Consultants,’ was led by Rob Hall (played by Jason Clarke). Both Fischer and Hall were among those killed during the real 1996 Mount Everest disaster. The script for Everest was reportedly based on the various written accounts about what happened in Mount Everest on May 10-11, 1996, as well on actual interviews with some of the survivors. Among the books written about the events are Into Thin Air by Jon Krakauer and Left For Dead: My Journey Home from Everest by Beck Weathers who were both members of Hall’s group at the time of the disaster and The Climb: Tragic Ambitions on Everest by Anatoli Boukreev who was part of Fischer’s group. Universal Pictures has bumped the survival drama Everest from February 27, 2015 to September 18, 2015. Directed by Baltasar Kormakur (2 Guns), the movie focuses on two different expeditions that struggle to survive while climbing the world’s tallest mountain. The film stars Jason Clarke, Josh Brolin, John Hawkes, and Jake Gyllenhaal as well as Martin Henderson, Emily Watson, Michael Kelly, and Thomas M. Wright. Even though we’ll have to wait a little longer, the date change is encouraging since Universal might think they have an awards contender if they’ve moved the picture to the fall. The studio will release Everest in 3D and IMAX 3D. Right now, there’s no competition on September 18, 2015, but a week later Sony will have the family flick Hotel Transylvania 2 and Warner Bros. is releasing the comedy The Intern. Hit the jump for the official synopsis for Everest. Everest is amongst the most anticipated movies of 2015. 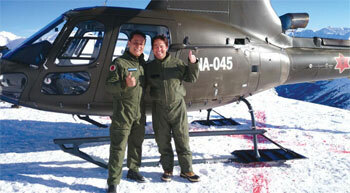 ALPINE SHOOT: Capt Vijay Lama (left) who acts as a rescue pilot in the forthcoming Hollywood movie Everest on location in the Italian Alps in early 2014 with a helicopter painted in Nepal Army colours. The story revolves around Beck Weathers, an American climber who miraculously survived two nights above 8,000m and was rescued with a Taiwanese climber, by Nepali Army rescue pilot, Col Madan KC from Camp II. The risky rescue was the highest-ever helicopter landing in history at the time. Col KC’s role is played by Nepali actor and airline pilot, Capt Vijay Lama. For Vijay Lama, who has acted in numerous Nepali films over the last three decades, 2014 was an exciting year in which he got to experience how Hollywood movies are made. He was on location in the Italian Alps in early 2014 where some of the scenes of the helicopter rescue on Mt Everest were shot. Later, he went toPinewood Studios to shoot some of the other scenes in a flight simulator. Being a pilot made the role easier for Lama, who insisted on speaking in Nepali with his co-pilot with English subtitles. Saban Films is in negotiations to acquire U.S. distrib rights on Tom Vaughan’s How to Make Love Like an Englishman starring Pierce Brosnan, Salma Hayek and Jessica Alba. Written by Matthew Newman, film follows a Cambridge University professor, played by Brosnan, who meets his match, portrayed by Hayek. However, complications ensue when the professor gets her graduate student stepsister (Alba) pregnant and he’s forced to re-evaluate his life of hedonistic excess. Saban Films president Bill Bromiley and Ness Saban negotiated on behalf of Saban Films, and CAA on behalf of the producers. Foreign is being handled by The Solution Entertainment Group. Also producing are Southpaw Entertainment’s Richard B. Lewis and Irish DreamTime’s Beau St.Clair with PalmStar Media Capital’s Kevin Frakes and Raj Brinder Singh, Remington Chase, Grant Cramer and Simon Orange. Pierce Brosnan, Michael R. Williams, Myles Nestel, Lisa Wilson, Matthew Newman, Stephan Martiroysan, Stuart Brown and Mike Sullivan are serving as EPs with Sriram Das and Steven Shapiro as co-EPs and Gabrielle Jerou-Tabak, Keith Arnold and Mark Fasano as co-producers. Merced Media Partners, PalmStar Media Capital, and Envision Entertainment financed How to Make Love Like an Englishman. Saban acquired Tommy Lees Jones directorial The Homesman out of Cannes, and the film was co-released by Roadside Attractions on November 14. Saban recently picked up U.S. for the Nicolas Cage crime thriller The Trust. Their slate also includes John Travolta’s The Forger; action thriller Tracers starring Taylor Lautner and Marie Avgeropoulos from Temple Hill Entertainment; and American Heist with Hayden Christensen, Adrien Brody, Jordana Brewster, Tory Kittles and Aliaune “AKON” Thiam. The Sundance Film Festival is the premiere fest for independent cinema. Today they’ve begun unloading their announcements, and while the Midnight titles won’t be revealed until tomorrow, we have found two genre films playing in other Sundance programs. Pictured above and in the below gallery is The Witch, hailing out of the U.S. and Canada. Robert Eggers both writes and directs with Anya Taylor Joy, Ralph Ineson, Kate Dickie, Harvey Scrimshaw, Lucas Dawson, Ellie Grainger starring. Craig Zobel’s Z for Zachariah will also premiere. Cast includes Chiwetel Ejiofor, Margot Robbie, and Chris Pine. “Spare Parts” Trailer is out! The inspirational drama “Spare Parts,” produced by and starring George Lopez, is based on a real David & Goliath story about four undocumented Mexican-American teenagers from Phoenix who form a robotics team. With $800, used car parts and a dream, they build an underwater robot that wins the national robotics competition, taking down reigning champion MIT. The film also stars Jamie Lee Curtis, Marisa Tomei and Nickelodeon star Carlos Pena. Posted in Uncategorized | Comments Off on “Spare Parts” Trailer is out! Variety has the exclusive first look photo from Craig Zobel’s “Z for Zachariah,” starring Chris Pine, Margot Robbie and Chiwetel Ejiofor. Adapted from Robert C. O’Brien post-apocalyptic 1974 novel, the thriller follows a small-town girl (Robbie) who lives alone on a farm in the only valley with breathable air in the wake of nuclear war. Her world is turned upside down when two strangers wander in from the forest. The film is directed by Craig Zobel, produced by Material Pictures, and exec produced by Lucky Hat Entertainment along with Silver Reel and Lotus Entertainment, who is handling international sales. The sci-fier is slated for release next year. Heist film “Bus 657″ has sold to a dozen territories with production wrapping in Mobile, Ala. The Emmett/Furla/Oasis Films production stars Robert De Niro, Jeffrey Dean Morgan, Kate Bosworth,Dave Bautista, Gina Carano, Morris Chestnut, Mark-Paul Gosselaar, DB Sweeney and Lydia Hull. Hannibal Classics is handling foreign sales at next week’s American Film Market. Scott Mann is directing from a script by Stephen Sepher and Max Adams, based on a story by Sepher.Producers are Sepher, Randall Emmett, George Furla and Alexander Tabrizi. Morgan and Bautista portray characters who partner to rob the casino where they both work – only to end up hijacking a bus and using the hostages as collateral when plans go awry. Chestnut portrays the enforcer for the casino’s owner, played by De Niro. Bus 657 has sold in Benelux to BBI Films; France to Marco Polo Production SAS; Germany to Elite Film AG; Greece to Hollywood Entertainment; Spain to Fisher Film Distribution Worldwide; the UK to Lionsgate International; and Australia and New Zealand to Anchor Bay Entertainment Australia Pty. MOBILE, Alabama – “Bus 657” screenwriter and actor Stephen Cyrus Sepher doesn’t have an agent or a manager, yet Robert De Niro, Jeffrey Dean Morgan and Dave Bautista are speaking his words and Sepher is acting alongside them. And as the L.A. native experiences his work being filmed in Mobile, it feels pretty dreamy. The casino heist thriller started filming in Mobile last week, and so far the cast and crew have made use of locations including The Battle House, Hayley’s Bar and the USS Alabama battleship. This is Sepher’s second time working in the Port City. He had a bit part in the Bruce Willis movie “Vice,” which was filmed here earlier this year. We recently caught up with Sepher and talked to him about his career, “Bus 657,” and of course, De Niro. A: I started acting when I was about 18 years old. I picked up writing because I wanted to showcase my acting. I’ve written probably about 13 screenplays along the way. Q: How have you reached this level of success without an agent or manager? Q: Please tell us about some of your other previous film projects. A: There’s a movie that I wrote, directed and acted in called “One More Round.” We had some really great TV actors in it. That was my first (feature film) and it was a good start. I also did a short film called “The Mortgage Guy” that was about the debacle of the mortgage industry. I wrote that about a year before the debacle actually happened. Q: “Bus 657” was originally called “Bus 757.” Why was the name changed? A: The distribution company had ideas about marketing this film. They didn’t want it to sound like an airplane. Q: How did you end up acting in the movie? A: When I signed my deal (for the screenplay) with the production company it was contingent upon me being in it as an actor. I negotiated a role as Julian Dante, one of the guys that helps rob this casino. A: The story’s about Jeffrey Dean Morgan’s character Luke Vaughn. He’s in a jam. His daughter needs to get an operation and he’s worked for Robert De Niro’s character The Pope for many years. The Pope owns the casino. Vaughn needs the money and he doesn’t get the money. He partners up with Dave Bautista, who plays a character named Cox. And I am Cox’s guy that he brings in and the three of us rob the casino…It’s not just a brainless action movie. It really touches on human emotions, survival and instincts. Q: How does the bus fit into all of this? A:I don’t want to give away the story, but the bus is used to get away. Q: What is the character of The Pope like? A: The Pope is a very established successful man who has done it his way as far as dealing with the underworld, and he wants to retire. This whole heist happens to be at the time when he’s kind of trying to do his thing and living life normally. We pull him back in to this whole crime thing. Q: Why is De Niro perfect for the role? Q: What are some of your favorite De Niro movies? A: I love “Midnight Run,” and I really liked him in “Casino” and “Goodfellas.” And the great thing is he’s playing a gangster in “Bus 657.” It’s a blessing. Q: How did you manage to snag De Niro for “Bus 657”? A: The producers, Emmett Furla Productions, made that happen. They pitched him the script and he liked it. He liked the writing and that was key. He wanted to be involved in it as The Pope. And then he worked with the director Scott Mann and they fine-tuned a lot of things. Q: Why is Mobile a good place to film? A: Some of the stuff is just like what you see on a Universal Studios back lot. A lot of the buildings and a lot of the streets are very much like the stuff they built in L.A., but its natural. There’s a lot of history here. Scott Mann is really a great director and he’s picked really incredible locations. The look of this movie, from what I’ve seen, is pretty amazing. Everybody from top down has brought their game to this on all levels. It’s looking really fantastic.